SIHAIXIN is committed to 100% satisfaction. Zero-Risk Purchase and 60 days Guarantee for our customers. We will offer the best solution for any issue of product you bought by SIHAIXIN Watch Store. So any problem, please feel free contact with us! Our Friendly Servise - 24 hours email customer service response. ★SUPER LIGHTWEIGHT - This watch is so lightweight you'll forget it's there. All natural wood watch made from organic sandalwood. It's soft, comfortable and durable enough to fit on a variety of wrist shapes and sizes. ★GOLDEN POINTER - Golden hand, you can read the time even In The Dark, 100% Natural Zebra Wood, multifunctional, Hand-Crafted, lightweight unique and eco-friendly. retro and classic, giving you a Maximum Comfortable Experience And Real Feelings. ★ULTRA-ACCURATE TIME KEEPING - Battery-powered quartz crystal analog movement powers gold hands for ultra-accurate time keeping. Dual locking deployment buckle and reinforced clasp secure adjustable wood bracelet (removable metal pins secure links together). 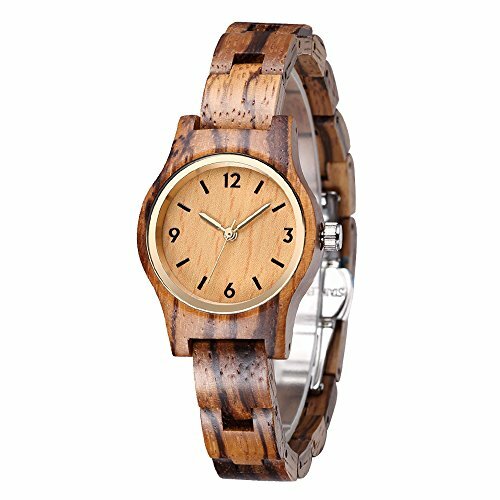 ★SIMPLE, LOVERLY AND FASHION - Strap width is 12mm, very small and tiny wooden strap, fit for women, ladies and girls.Carefully Prepared & Packaged.Wood Watch is a Best Gift choice to your Loved Ones for Xmas, thanksgiving day, Hollywood,birthday, wedding, anniversary, graduation. If you have any questions about this product by SIHAIXIN, contact us by completing and submitting the form below. If you are looking for a specif part number, please include it with your message.